Title photo as well as inserts 3 and 4 of L. lankongense in natural habitat as photographed by Yijia Wang. Copyright Yijia Wang, all rights reserved. Used with permission. Yijia Wang offers seed of several Chinese Alpine Lilies at his nursery at www.canursery.com along with seed of other Chinese Alpine plants. Photo insert #1 is of our daughter standing in a sea of the L. lankongense hybrid 'Ariadne'. 'Ariadne' was bred by Dr. Christopher North of the UK and introduced in 1976. 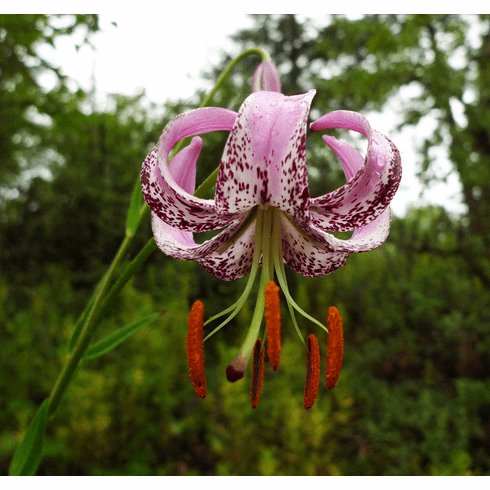 Photo insert #2 is of seed grown L. lankongense in cool greenhouse, B & D Lilies cir. 1990.